This is an extraordinary supported process that will get you to write and COMPLETE your book. Join this community of writers from all over the world to travel this journey. You will plan, write and produce your first draft. You will be guided on all aspects of planning and writing. Once your book is completed we will facilitate your submission to our SA and US publisher network. This intense mentorship programme with prompt, push and hold you to your promise to write your book. This is a structured course done in a combination of emails, live video conference calls, personal coaching sessions, interviews and lessons to get your book written. The aim is to get you to sit down and write with accountability, weekly tasks, lessons and support. This is about a COMMITMENT TO WRITE YOUR BOOK no matter what. All the other accountability factors are the real day-to-day stuff to keep you writing. This group will be a combination of the following. A private Facebook group for weekly support, feedback and accountability.? Get a professional insiders view to give you insight on writing and publishing and help you to write WITH INTENTION. Fixed and scheduled writing time and deadlines. A step by step structure to follow specific TASKS weekly - for the 4 months. A one-on-one buddy for regular support. Plus additional input from authors and experts who have been there and done it. What is editing books all about? How to edit your own book with Sean Fraser. METZ PRESS Director Wilsia who owns South African based Metz press for the past 22 years will be sharing expertise on traditional publishing. Dealing with EMOTIONS of writing, the procrastination, overwhelm that will kick you to touch if you don’t know how to handle it. I have worked with writers for over 15 years to get their book written, and published. After many years of teaching writing I have found this magical online course has changed my entire view of the process. I have always advocated writing alone but the group dynamic of these courses takes on a life of its own. It has been a break-out success and the constant push towards the finish has kept writers going. The support is incredible and writers who are clear they want to write a book will get there on this course. Added to that they get my structure and step-by-step process on how to plot, plan and write a book"
I’m no writer but had a story I needed to tell. 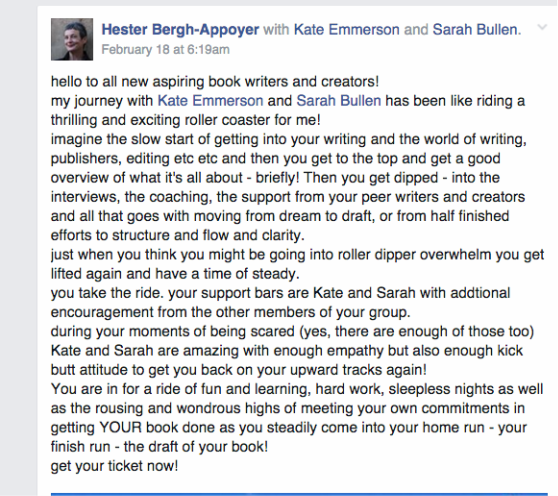 If you have a book “inside” you and you have determination then catch a ride with Sarah and Kate. Hold on tight – it won’t be easy, and it does take time, but if you do it their way – and do everything they say, you will get your first draft done. Their wealth of knowledge on the craft of writing, the industry, and process and the motivation around it all was priceless. Book 2 to follow soon and no doubt through this process again with them. Costa Carastavrakis - From Addict to Athlete. ?“I never knew how to share my story, and then like a divine gift from the universe, came Kate and Sarah. From book structure and editing to publishing, branding and PR I did it! And if I can, you can. What an incredible experience – let them show you how. It’s a life-changing journey. You have motivated me to fulfill my dreams: Hannelie Bronkhorst. D-Day – Wow! What a journey. Yes I have a first draft! 89 000 words! Carmen Tina Schneider. I absolutely loved the book mastermind with Kate Emmerson and Sarah Bullen, the guest speakers and my fellow aspiring authors. Not having been an author before, the mastermind experience gave me the grounding I needed to complete three chapters for a co-authored book and get started on my first book. We wanted to share some of our writers publishing success stories! Sarah Bullen is an international writing coach, author and book editor at The Writing Room who has worked with over 2,000 writers since 2005 and has 31 published authors that have come through her mentorships. She works with writers and publishers all over the world to help them find and tell their best story - in any format. Sarah has written six books and writes for magazines internationally. She is a regular guest on talk shows and a keynote speaker at writing workshops internationally and does one-on-one writing coaching, journaling journeys and development work through writing and is the book coach for BossLady. Sarah’s clients are based all over the world and she runs courses and retreats in the UK, US, Greece, Ireland and South Africa. Kate Emmerson - known as THE QUICK SHIFT DEVA shares her enLIGHTening ideas of LIVE LIGHT LIVE LARGE around LIVE LIGHT LIVE LARGE around the globe. She is South Africa’s foremost clutter expert, sought after international speaker, professional lifestyle coach, mentorship facilitator for writers and runs retreats and masterminds in idyllic locations, including Greece, Rome, Dubai, USA and South Africa. She has had 2 books published in South Africa with Metz Press and recently joined forces in the USA to publish her 3rd book and written 6 online courses. Watch us talking all about books and writing on this FB Live video.